This is the text of a brief presentation that I delivered yesterday in DC at a symposium on radical life extension. In a new experiment (for me), I’ve prepared a self-presenting powerpoint, with voice and images that you can view either with PPT software or as a Youtube video. In the old view of aging, evolution has neglected her children in old age because in the wild, hardly anyone ever survives to old age. So the body is permitted to fall apart. Damage accumulates. The body wears out like an old machine. Another part of this picture is that all the stresses of modern life are accelerating aging. Pollution, pesticides, radiation, and high-fructose corn syrup are stresses that the body just wasn’t evolved to cope with, and they wear us down faster, shortening our life span. But in the 1990s, evidence against this picture began to accumulate. For one thing, aging takes a huge bite out of fitness in the wild. Animals do live long enough for aging to be a factor in the death rate. For another, people are not cars. A car wears out faster the more you drive it. But our bodies respond to stress by overcompensating so that the more active we are, the longer we live. Animals too, live longer with intense exercise. It’s called “hormesis”. Other kinds of stress, like starvation and certain toxins, radiation, infections, heat and cold also increase life span, paradoxically. If the body were just wearing out, this would be very hard to explain. A third point against the theory is that genetic scientists began to discover “aging genes”. I define an aging gene to be one that can be deleted with genetic engineering and the animal lives longer without it. Dozens of such genes are known now in every lab species where they have been sought. The record is for a gene known as AGE-1 in lab worms. When both copies of this gene are knocked out, the worms’ lives are extended tenfold. A completely unexpected thing about these genes is that they come in families that span the entire biosphere. Genes for aging in you and me are closely related to genes for aging in the fruit fly and the worm and even primitive yeast cells. This can only mean that aging genes are evolutionarily conserved. That is, they are an adaptation, a product of natural selection. Evolution has arranged for us to die on a schedule. We have genes with no other purpose than to destroy us. Suicide genes. Our bodies don’t wear out despite nature’s best efforts to protect us. On the contrary, aging is an active process of self-destruction, bequeathed to us by nature, programmed into our genes. If you believe the old view, then nature is our friend. Our bodies are doing their best to resist the ravages of aging, and our job is to help the body out. Natural foods, in particular, support the body by giving it the fuel that it was evolved to work with. Low stress and a slower pace help preserve the body. Eat organic. But in the new picture, moderate stress prolongs life span. Hunger is good for us. Intense exercise that makes us feel like we can’t stand it is one of the best things we can do for ourselves. Even poisons can promote longevity. How can this be, that the body does so much better at forestalling aging when it is stressed? What adaptive purpose is served by death on a schedule? There’s an evolutionary story behind it which is the centerpiece of my own research. The reason that aging evolved is to take control of the death rate, to level it out so everyone doesn’t die all at once. In nature, starvation is the biggest threat to life. And it tends to kill everyone at the same time. When there’s no food for me, there’s probably no food for you either. There’s a famine and we all die together. This is called extinction. Not good for evolution. Aging evolved for the purpose of helping to avoid population overshoot, to level out the death rate so the ecosystem can find its equilibrium. In this way, aging protects against extinctions. When there’s plenty of food and no one is dying of starvation, that’s when nature needs aging, to help raise the death rate. But when food is really scarce and some are dying of starvation, more death (from old age) is the last thing the ecosystem needs. So aging takes a vacation when the population is stressed. This is the reason that things that prolong our lives tend to be uncomfortable. We need to send the body stress signals to suggest that there’s already plenty of death in the air, and then aging will loosen its grip on us. In the old view, oxidative stress is the enemy, a kind of rusting from the inside out. But in the new view, oxidative stress is part of the signaling that tells the body to protect itself. Anti-oxidants – vitamins A, C and E were tried and tried, in animals and in humans – and they actually increase mortality. Intense exercise, on the other hand, generates loads of free radicals and it’s actually the free radicals that signal the body to go into a protective state. Taking anti-oxidants before you exercise can nullify some of the benefits! There is a shortcut to life extension based on hormonal signaling. As life extensionists, we are advocates for conservation and birth control. We’ve already talked about #1. There is no such thing as “natural anti-aging”. Aging itself is natural. We can only extend life span by fighting with nature, manipulating or tricking evolutionary programs. We do this with exercise, with hormesis, with caloric restriction and its mimetics. But that trick is limited to the built-in buffer that nature has provided – probably 5 to 10 years of extra life. To go beyond 10 years, #2 is deeply promising. The old view was pessimistic. Since evolution has already done its best for long life, we’re going to have to think of something that evolution hasn’t been able to come up with in a billion years. But if we think that our genes have a built-in death program, then all we have to do is to thwart that biochemical program. Turn it off. Throw a monkey wrench into the suicide machine. Interfering with biochemical pathways is something that the pharmaceutical industry is really good at. Hormones and receptors are lock and key molecules. You make a molecule that sticks in the receptor, and this blocks the action of the hormone. This approach to anti-aging is very promising. In this new picture, where aging is programmed self-destruction, the body must have some way of knowing how old it is. This implies that there is an aging clock, or more likely, several redundant clocks. There is the very exciting promise that we might be able not just to slow down the aging clock, but to reset the hands to a younger state. 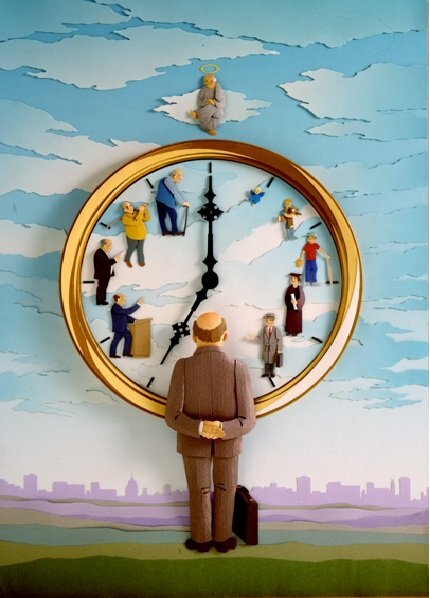 The one aging clock that we already know about is telomere length. I have written in this column about telomeres, and you have heard the story elsewhere, I’m sure. With every cell division, our stem cells lose a little DNA, from the tail of each chromosome. Telomere length is inversely related to mortality, in humans and in animals. Short telomeres contribute to all the diseases of old age. There are several herbal products available NOW [1,2,3,4] that offer some ability to lengthen telomeres. Enough to slow the clock, but not enough to actually set the hands back. There is research going on in several private companies, seeking ways to do a better job of re-setting the telomere clock using designer chemistry. The best lab that I know of is Sierra Sciences, and they are presently stalled for lack of funds – a great opportunity for investors to step forward. We know that telomere length is an important clock, but we also know that it is not the only biological clock. A hot topic in research the last year or so is the epigenetics of aging. Which genes are active and which are inactive? This is “gene expression” and it changes with age. I have floated the idea just this year that gene expression constitutes a powerful aging clock. That if we can direct the old body to activate a young gene profile, then the body will respond by turning itself young. You might think that there’s some kind of “youth serum,” something the body isn’t able to make when it’s old that it used to make when it was young. But the fact seems to be more the opposite: that there are blood factors that the body makes when it’s old but not when it’s young that are turn on the suicide program. #3 is my final message to you. You and I are part of a community dedicated to extending the human life span. We are succeeding, and this is a wonderful thing for every individual who receives the benefit. But evolution tells us that in addition to individual good there is a separate collective good. What is good for every individual may be disastrous for the community. This is the tragedy of the commons. In fact, aging evolved for the purpose of controlling population overshoot. For 150 years now, humans have succeeded in extending our life spans worldwide. The individual result has been an enormous lifting of a burden of suffering and fear of untimely death. But the collective result has been that humans are a blight on the biosphere. The rate of extinction is unprecedented – higher even than the great dinosaur die-off of 65 million years ago. There are resources that were built up over millions of years, and we’re using them up as if they belonged to us, with no consideration of future generations, or other life forms. We, as the world’s top predator, depend on a diverse ecological base of plants and animals, ocean and land species, insects, algae, plankton, bacteria… If we destroy that base, we destroy ourselves. And we are destroying it, with reckless abandon. People who imagine that the world can be turned into a great farm to support tens of billions of humans understand nothing about ecology. The robustness of the natural world depends on diversity. If our dream of extending human life span is not to turn into a nightmare of famine and resource wars, then you and I must split our time between promoting life extension and promoting (1) conservation – the environmental footprint of each human, and (2) population control, bringing down the birth rate to match the falling death rate. Excellent, as usual. So different from the common view. And the good news : I can keep running marathons and generate tons of ROS, and not spend money on anti-oxydants. Sorry but running does not generate ROS. Just the opposite! Exercise is an anti-oxydant. One idea not mentioned in the article is that of zooprophylaxis. Some animals (e.g. the western fence lizard), can be bitten by infected ticks, remain uninfected, and also manage to kill off the Lyme bacteria in the tick gut, through a chemical or protein in their blood. If this is of interest, I have provided links to articles on this subject as a P.S. If spirochetal infection of the brain is an important causal factor in Alzheimer’s, then it may be that the Lyme bacteria zooprophylactic agent could be identified and be of some use for human disease prevention or treatment. I was rereading your post and checking on the sites that offer telomere “limitation of shortening” products. At least a supplement that would be efficient ! Have you tried any of the products you mention ? I’ve been taking Product B consistently for about 4 months and TA-65 on-and-off for 9. I haven’t had my telomere length assayed yet, and these things take a long time to show effect, so I wouldn’t look for measurable effects until 2 years down the road. Even then, the scatter in telomere measurements is so large that it’s unrealistic to expect predictable results in any one indiviidual. Hunting behavior of wolves is not so relevant, but species that kill others of the same species are an interesting topic, and it’s a good bet it evolved as a population control adaptation. Beetles and octopuses and fish will eat their young when conditions are crowded. Ants and chimpanzees have turf wars. Why don’t bonobos fight? Human wars seem an extreme, and Jared Diamond has written about how wars shaped human evolution.